Fun fact, the name SooFoo is short for Super Good Food and it is pronounced exactly as it looks. It’s as fun to say as it is to eat! Here is a brief history of how SooFoo came to be. Having blended grains and lentils for himself in his own kitchen, Maurice Kanbar (Investor, Entrepreneur, Author, Movie Producer, and Master Distiller) hit on the “perfect” combination of 9 ingredients including: Long Grain Brown Rice, Brown Lentils, Wheat Berries, Oats, Barley, Black Lentils, Rye Berries, Green Lentils and Buckwheat. His friends and family urged him to market it to the world, so he did and here it is. He decided to call it SooFoo because it is Super Good Food. When combined these 9 ingredients all cook at a very similar rate so when prepared it provides the perfect combination of taste and texture. While SooFoo is an outstanding stand-alone food, those matched ingredients provide the perfect foundation to make many different dishes. Check out our constantly updating recipe ideas on our website. 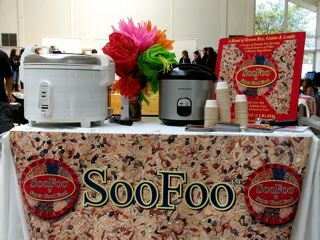 Haven’t tried SooFoo yet? Currently we have retailers in place in the west, southwest and northeast but we are expanding quickly. You can check our store locator and also order SooFoo on our website. We also host several demos in stores each week so please follow us on Twitter to see when SooFoo will be coming to a store near you.